Fort Pierce Florida is intersected by four routes. I-95 (N-S) exit 131A, the Florida Turnpike (N-S) exit 152, Florida route 70 (East), US-1 (N-S). The starting point of this route can be found at the intersection of US-1 and A1A (South). From there, follow the directions listed throughout the description above and/or use the online map above. For anyone who has just started cruising, this a great route to take. It has a great balance of open relaxing highway, and rural road that's just enough. For the experienced cruiser, this route offers the right amount of scenery and is just long enough! I've been running this route for thirty years and it's never gotten old. You'll love it! Starting from Fort Pierce, at US-1 and Seaway Drive (A1A), go East to the beach. Turn right onto S. Ocean drive and you're on your way to a 12 mile run of unspoiled highway. (Once past a few beach-front homes,) this is "cruising"! At about fifteen miles you come to the Jensen Beach "round-a-bout". (If you decide to head West here you shorten the route by about ten miles...) But keep going South. Just before the first bridge, (at the conv. store) you'll see the first traffic light in 21 miles. Head over the two new Bridges and turn right (North) on Indian River Drive. (NOTE! the speed limit on this section is 35 MPH! People have been stopped, (but not ticketed) for going 38 MPH... And, ticketed for 40! Once past there, you're going North, along the Indian River Lagoon for more than 18 miles. You'll pass through Jensen Beach, a few railroad "whistle stops" and come back into Fort Pierce and the beginning of the route..
Seaway Dr. is level and smooth with a few turns. - S. Ocean Dr. is re-surfacing from Ft. - Pierce Beach, S. to the St. Lucie power plant, brand new black top! - S. of the power plant, is original road, "Warn!". (Contrary to riding rules, the best ride is in the center of the lane.) - S. of the round-a-bout it's smooth and straight with new surfaces. - All of Indian River Dr. is new! This is a great ride for anyone who's new to cruising! . There are Nature Centers and quite a few shops and restaurants on the return run of this trip too. Sewall's Point, Jensen Beach and Fort Pierce all have plenty of shops, eating and sights. 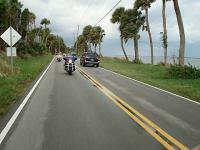 If you decide to take this route on a Thursday, you'll be coming back into Fort Pierce for their weekly "Bike Night". They close off 2nd St. (except for bikes,) fire up the band and open the doors to the restaurants in town... It's great fun! Just remember it's not the destination... it's the journey! on June 24, 2013 3 out of 3 members found this review useful. Considering that Florida is not the most ideal place for riding this one is pretty good. The scenery is pretty nice and you will see some damn expensive areas on the way which I personally didn't know about.The speed limits are horrible but what is worse is most of the other drivers that you will have to put up with. Cars passing from the left hauling boats and going over the speed limit that is something you need to be careful. Other than that its a very enjoyable ride. on September 10, 2010 3 out of 4 members found this review useful. This is a great ride! I live in the area and do this ride often. It doesn't get old. Lots of Biker Friendly stops along the route. Also if you want to extend the ride. Take the north A1A bridge up to Wabasso then back south on US1 through Vero Beach back to Ft. Pierce. on March 16, 2014 2 out of 2 members found this review useful. While this route is great for the area, the west side of indian river drive is full of blind driveways and turn outs. Cars that come out of these driveways dont look half the time before pulling onto the road. If they do stop to look they are halfway into the southbound lane. If you get pulled over expect the worst. Avoid low tide or you will be smelling it for the rest of the ride. To recap, blind driveways on the west, trees and 20' drop off to the east, cops, lots of gravel, low tide stench. on February 10, 2011 2 out of 2 members found this review useful. How can a policeman write a ticket when the speed is less than 6mph from the speed limit? Ask the officer to see what is violation that he will write on the ticket. Not for speeding less than 6mph. Don't let the crooked cops fooled you. It's FL laws. on November 27, 2009 1 out of 3 members found this review useful. This is a great route. I have ridden a lot of different roads, and I love this route. I live near it and never get tired of riding it. As mentioned above, stop by Archies. Great food, and entertainment. on May 2, 2009 1 out of 1 members found this review useful. The roads and view are great both on the Island and Indian River drive. We enjoyed the winding drive along the river the most. Traffic was lite and moved at a constant 35MPH. on February 20, 2017 0 out of 0 members found this review useful. Decent ride, you can actually stretch this up into Ft. Pierce a little longer. As long as you obey the speed limit, you will have a great ride. More police presence now so it is safer to ride. You will get the occasional tailgater but it is one of our selected routes to Vero from PSL. BEWARE:: Archie's is known to inflate prices or add items to their bills. ALWAYS check your bill. They do this to locals and tourists. Keep the menu handy when paying. You will see. We no longer stop there. on August 18, 2009 0 out of 0 members found this review useful. This is an amazing ride. I found it by accident one day as I rode south by myself after my brother passed. I have since taken my riding group on this ride. It is easy, relaxing and a great ride! on January 5, 2009 0 out of 1 members found this review useful. on October 25, 2008 0 out of 0 members found this review useful. Make a stop in downtown Jensen at Crawdaddy's. It's 1/2 block off Indian River Drive at Jensen Beach Blvd. Grab a bucket of crawdads and free canjun boiled p-nuts at the bar. It's the best N'Orlean's cooking this side of the Mississippi. Also live bluesThursday-Sunday.